The Sugarcane Hitchhiker Kickstarter – A daughter’s attempt to complete the story her father left behind. A daughter’s attempt, in words and original artwork, to complete the untold story her father left behind. The TV was still on when I walked into my father’s bedroom at the top of that narrow, creaking staircase. The bedroom he shared with his brother as a kid, the bedroom he shared with my mother years later. I was conceived in that bedroom. And when I saw my father’s empty bed I collapsed on it and cried and wished I’d never been born. But the TV was still on, and the ashtrays overflowing. Glass jars filled with paintbrushes lining the windowsills. Piles of magazines and sketchbooks and journals everywhere. The smell of cigarettes was still thick in the air, the fine residue of crushed pills still visible on his desk. My father had been a mess, like me. And now this mess was all I had left of him. It’s been nearly three years since my father died. I’ve managed to hold on to almost everything he left in that room, every unfinished watercolor and half-written essay…every faded photograph. He was telling a story, my father, in images and words…the story of his adolescence, of running away with Timothy Leary and drinking with Janis Joplin. He was telling the story of the years we spent apart…my childhood. It was better that way, he told me later — better that the darkest and most self-destructive moments of his life happened far away in the booze-soaked bayou. As a kid, whenever people asked me about my dad, I always said he was in New Orleans. It was true, but I didn’t know what it meant at the time. I would find out eventually. I am my father’s daughter, down to the brittle bone. I am the only person alive who can finish his story. Through a combination of his artwork and writing and my own, The Sugarcane Hitchhiker is my attempt to do just that. Are you tired of fumbling with your messy keys or feeling uncomfortable with them in your pocket? …Time for that to change!!! Designed to be versatile in it’s simplicity. I have been working out the Idea for GatorKey for half a year now. I just wanted an easier way to organize and carry my keys instead of poking me in pocket and fumbling when I get to my door. I have seen other more complicated and expensive options but they didn’t seem worth the trouble. I truly believe you will be as happy as I am with this innovative and stylish solution. My goal is to get these into the hands of as many people as I can. I realize a lot of people don’t think about their keychains but if you think smart about it… you won’t have to think about it at all. Q. Who would “GatorKey” appeal to? *3 buttons on one side for quick access to keys. *Velcro on the other side for total access for mounting keys. *Fits most key sizes and the high quality elastic compacts keys to fit easily in your pocket or purse. *Each Gatorkey pouch holds up to approximately 4-5 keys depending on key size. *Keep your home keys in one pouch and your work keys in another. Sewing house I have been working with. first sample…ahh…how far we have come. I have found a manufacturer in NYC. I have found a supplier of the hardware offshore. I have secured a sewing house here in NYC to sew the Gator pouches together. I have been working with them for 4 months now on the design and function of the keychain. I feel confident that they will be able to meet quantity and quality of demand. I have made several samples and have tested them to insure that they work as designed. I have completed the design of the packaging that you will receive once the project is fully funded. I have setup an account with a fulfillment house in california that can ship items domestically and anywhere in the world. I have done a lot of the leg work ahead of time to be ready if my project is lucky enough to be successfully funded. With the funds raised on Kickstarter, I will be able to do the first production run of GatorKey. The success of this project will depend heavily on your word of mouth and how the news spreads. Exposure on every blog and social networking post counts, so please share. Thank you for visiting my project page, and thank you in advance for your support. The Surrender Kickstarter – 24 days to go! Be inspired to shift life purpose and meaning by focusing on empowering photographic and word images that take you beyond the norm. Surrender is a provocative and visually striking photographic essay that primarily honors women, while also honoring the dignity of life altogether. Surrender honors women by stimulating the surrender of our outdated views and attitudes towards women; views and attitudes of both men and women. It honors the dignity of life by clarifying life purpose and meaning through a spiritual narrative, releasing the stunning inner images that speak through spiritual awareness. Through the photographic and word images alike, it celebrates the innate beauty of the human figure and soul, as we stand naked before God in all our innocence. Some even say that Surrender is about Mary Magdalene’s empathic experiencing of the Jesus’ last days. However, this book is not about religion, or even spirituality. Surrender is a book aboutyou! Surely, it will have its very own profound impact on you—and it could well empower you beyond measure. Surrender will be printed in a 9” X 9” format, using a tri-tone process to make these exquisite black and white images look as close as possible to their archival print counterparts. Some background: Although I have authored and published 16 spiritual books with three different publishers in the past 7-8 years, photograph books are exceptionally expensive and thus difficult to publish. When combined with the nature of these photographs, publishers have been reluctant to address spiritual issues using such powerful images. Even so, I’ve worked diligently to see that Surrender has as least found its way into many individual collections through the Amazon/Kindle digital publishing program. (See this version on my website: www.creationspirit.net.) Since its release a little over a year ago, readers continue to clamor for a first rate tabletop hard copy, as well as wanting to obtain prints of the images themselves. Recently, two artist friends who also happen to be gallery owners—both of whom have contributed commentary to this book—suggested that rather than trying to get galleries to make all the images available at once, perhaps publishing the collection in book form would do the trick—thus putting the entire collection and related perks into the hands of artistically and spiritually motivated patrons at much less expense. Eureka! Archival limited edition perk to you! So here it is. Surrender is fully designed and ready to go. It’s up to us now. Let’s show the world what it really means to collaborate! Because you’d be the proud owners, not only of an autographed, limited edition classic photo book of black and white images and sterling commentary, but also—depending on the level of support provided—the possessor of a signed, limited edition archival gelatin silver photograph for your collection. Because you’re a good friend, a loving family member, a treasured member of my computer-based social family or simply interested in fine art photography and/or spiritual issues. Because you’re interested in issues of the heart and being empowered by deeper meaning gained from a variety of sources. Because you would like to share this abundance with other loved ones, those who also appreciate such approaches to deeper meaning and clearer purpose. Because you’d like a book on your coffee table that could spark interesting conversations with neighbors, visitors, friends, colleagues and family. Because you think the body of work deserves to be published, and are moved to be part of bringing this creative venture to fruition. Whatever your reason(s), I invite you to join me in making this project a reality by making finances available pertinent to your level of desire and interest. The cost for publishing a limited edition of Surrender is $8500. This is not inexpensive, but this is what it takes to make a great book—a book you can give for a special occasion, and get lost in for a change of inner scenery, which is sure to also transform how you see life—from the inside, out. Over the years, I’ve invested far more than this amount of money, plus immeasurable time and energy, to bring the images and the Amazon/Kindle version of Surrender to fruition. And I’ve contributed hundreds of books from my collection to others, simply to help “seed” the spiritual development of interested persons. Now, at this point, I’m asking for your help to make this single printed version a reality. For all these reasons, I would greatly appreciate your generosity of spirit, both financially and by telling your friends about this opportunity, so they, too, can join in. The WavyWand uses LEDs and motion to draw images and messages in mid air. Must have at Burning Man, concerts, parties, or just for fun. The WavyWand is a programmable hand held device that is capable of displaying images and messages in mid air. Similar to the “light streaks” that one perceives when waving around a sparkler at night, the WavyWand draws these images and messages by turning on and off LEDs as the wand is waved from side to side. The simple answer is “persistence of vision” but what is it? The human eye has the ability to “remember” what it saw for a split second after it saw it. This is especially evident with high contrast images like a bright sparkler flame against a dark night sky. When images like these are viewed in quick succession, your eyes will merge what they saw over a short period of time, similar to a camera with a long open shutter. In the sparkler picture above, for example, there are not actually lines of light but because the camera captured the light point in many different positions over a period of time, the combination of these light points make the light look like continuous lines in the air. If we take time snapshots of what LEDs are turned on at different intervals as a WavyWand is drawing the heart above, we can see that at any given moment only the LEDs that correspond to a single line of the picture are illuminated. Thanks to your eyes’ ability to remember and merge the sequence of lines, you can see a heart. What can the WavyWand display? The WavyWand interprets images similarly to other display devices that have pixel height and width. Phones, for example, that might have screens with pixel dimensions 320 x 240 can display images up to that size. The WavyWand’s pixel height is fixed and corresponds to the 48 LEDs along its length. The width however is not fixed and mostly depends on how wide the wand is waved from side to side. To understand this better, we need to look a bit closer at how the WavyWand works. The LEDs on the wand are roughly 3mm high. This means the “pixel” height is roughly 3mm. For images to appear at the correct aspect ratio, we want the pixel width to also be about 3mm. Since the LEDs are moving from side to side, the pixel width is determined by how long an LED is turned on for as it is in motion. In other words, if we want a pixel width of 3mm the LED needs to be turned on for as long as it takes the LED to move 3mm through the air along the arc of the wave. One might think that waving a wand from side to side is simple stuff but surprisingly, every person will do it slightly differently. Finding the correct timing on the WavyWand required some experimentation and measuring the average “wave time” of many different people. Each WavyWand has a motion sensor and a micro controller, a tiny computer, that controls every individual LED. When the wand is waved from side to side, the computer measures the time it takes the wand to move from the one edge of the wave to the opposite edge of the wave. That length of time is then divided up into the number of pixels for the image width. The average user has a wave large enough to display an image 80 to 100 pixels wide. In conclusion, the WavyWand can display anything imaginable that can be drawn in a 48 x 100 pixel image. Like the K for Kickstarter. The WavyWand has three push-buttons and an alphabet printed next to the LED display that are all used together to compose messages on the spot. More complicated images and animations can be programmed from a computer. Easy to use software allows most images to be imported and programmed onto a WavyWand. Depending on their size, the WavyWand can store several images, animations and messages that can each be selected and displayed. The WavyWand is made from ABS plastic. The lens that covers the LEDs is clear acrylic. The wand is 42.5cm long and about 3cm wide at the handle. As mentioned before, there are 48 Light Emitting Diodes. The WavyWand is powered by three AAA batteries that are easily replaceable by removing the cover form the back of the handle. The programming cable connector is also located behind the battery cover. As a bonus, the WavyWand also has a built-in LED flashlight at the tip of the wand’s display. More information about the WavyWand and how to use it is available on our website. With your help we would like to bring the WavyWand back (with a few improvements of course!) With enough pledges we can get the production quantities up and the costs down. We will be using some of the funds to set up the manufacturing line and updating the design as needed, but the majority will be going directly towards the product and getting it out to you! There are constantly newer types of LEDs being manufactured that are brighter and more efficient than the last. Using these types of LEDs will give the WavyWand a brighter display and a longer battery life. The inventor of the now commonly used USB, Ajay Bhatt, was recently interviewed on CNN. During the interview, they mentioned that there is estimated to be over a billion USB devices in use today. This is great news for the WavyWand because it means it is now less costly to buy micro controllers with built-in USB support. The WavyWand will be one more of these many devices that connects to a computer via the commonly used USB cable. 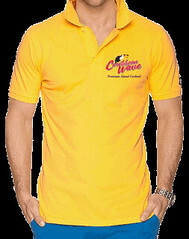 WareArt pledges: During manufacturing each WavyWand is pre-programmed with several animations, images and text messages. On the first model we focused the WaveArt around themes from some of the major public holidays such as Halloween and 4th of July. This time around, we thought it would be great to get suggestions from the Kickstarter community. We are, therefore, going to make it part of our pledge rewards. For the respective WaveArt pledges we will accept from you one suggestion for a text message, image or animation. We realize that there will be more suggestions than what we can fit onto the WavyWand so we will send out all the suggestions and allow people to vote for their favorites. Each WaveArt pledge will also receive one of these awesome WavyWand carabiner keyholders. WavyWand pledges: With all the LEDs available today there are many colors to choose from but unfortunately we have to limit what we manufacture to just a few in order to make it cost effective. We will be using yellow, red and green LEDs. Each WavyWand pledge will receive a WavyWand with their choice of yellow, red or green LEDs. By pledging a few dollars more, WavyWand+ pledges will also receive a programming cable with your WavyWand. Kickstarter pledges: On this special Kickstarter occasion we can’t resist going for the blue! For those who would like a WavyWand that is just that much cooler, we are going to manufacture a limited number of wands with blue LEDs. Custom WavyWand pledges: We’ve heard of so many different ways in which people have used WavyWands in the past that we would like to keep the creativity flowing by offering this custom WavyWand pledge category. For this pledge we will customize and you will receive a dozen WavyWands as a set with your choice of images, animations and messages. You can be as creative as you wish. 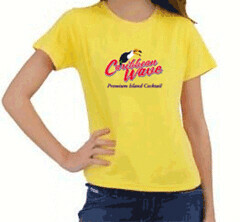 We can customize them with your company logo, or team mascot. Someone’s name for a surprise birthday party. Take some to Burning Man. How about at graduation? Q: Have any of the above photos been edited? A: Only the “Time snapshots” photos have be modified from the original to show how the LEDs change over time. Q: In the large photo of the heart, why is the hand and the WavyWand not more blurry? A: The camera shutter speed was set very slow to capture the entire heart. The flash was set to go off just before the shutter closed. This allowed us to capture the hand and the WavyWand. One can actually still see some of the background reflections in the water visible through the hand. Q: In the photos of the heart, why does it look like there is a light streak above the image? A: These photos where taken with the built-in flashlight turned on. Similar to the sparkler photo above, the flashlight moving through the air appears like a continuous line of light. Q: Who made your video? A: HYPERFOX, a company located in Poland that does video production, animation and motion design work. Have you ever made a wish that you regretted when it came true? The Wish is a young adult novel in which Sara Jones, a fourteen year old girl vacationing in New York City, makes an offhand wish in her mind while speaking to a fortune teller, that her brother would “just go away”. When he tragically dies in an accident the next day, her life is thrown into a tailspin of grief and guilt, culminating in her decision to run away and travel alone from her home in California back to New York to seek out the fortune teller and try to undo her wish. Along her journey, the previously sheltered Sara is confronted with the ever present fear of her true identity being found out, the strain of the guilt she feels compounded by what she knows she must be putting her parents through, and encountering dangerous situations that she is ill prepared to deal with on her own; all while coping with the normal insecurities that a young girl coming of age experiences. She also meets Jessica, the free spirited college student with an appetite for trouble, as well as Dylan, the handsome friendly boy who has had his share of tragedy in his own life. What happens when Sara gets back to New York City? Now, you wouldn’t want me to ruin the ending for you, would you? I’ve been writing all my life, and I feel that having taught teenagers for over a decade, I have insight into some of the challenges they face trying to establish a personal feeling of “self” and identity in a world that is less and less private every day. One of the major themes of The Wish is the fine line between accepting responsibility and not blaming yourself for the things that you cannot control. Teens today constantly blame themselves for things that are beyond their control, such as a divorce in their family, as well as other issues that many families face. In The Wish I explore this issue as well as others that I’ve borne witness to through my years of working with teenagers. The Wish is for anyone who has ever experienced guilt over something they could not control, as well as for those who enjoy adventure and self discovery. Although written for older middle-schoolers through high school teens, the themes in the book are ones that all adults have gone through at one point in their lives. 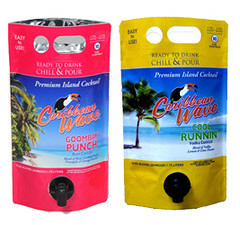 Bring Caribbean Bartender Cocktails to consumers in ready to drink pouches. 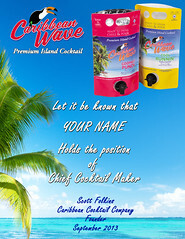 I am Scott, founder and creator of Caribbean Wave Premium Island Cocktails. Yes, that is me in the video. 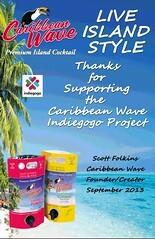 Thanks for considering supporting my project to produce Caribbean Wave Premium Island Cocktails in ready to drink pouches and backing the $20,000 goal so consumers can have a taste of the islands. I am an experienced beverage sales and marketing executive (23 years) who has created a unique and innovative product. You can learn more about my experience later in this summary. During my trips to the Caribbean I fell in love with the island cocktails made by local bartenders. The bartenders taught me their special techniques and the ingredients that make them truly unique. I asked them if I could use the recipes in the US. They said “Yea Man” (Island for go ahead). I sourced the best island ingredients available then created a manufacturing process keeping true to the Caribbean cocktail tradition and making them ready to drink. I developed a process to put them in eco-friendly party size pouches with an easy pour spout so you could take these island cocktails anywhere and share them with your friends. Goombay Punch Rum Cocktail (red) – Special silver rum blended with our secret formula which includes peach, pineapple, orange, coconut and a couple of others that I keep in the formula vault. Cool Runnin Vodka Cocktail (yellow) – Special vodka blended with lemon and lime and other ingredients that I keep in the formula vault. Only $20,000 for a project of this type? I am only asking for your support for what I need at this time. 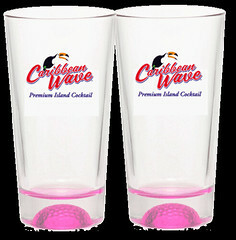 I have invested $125,000 of my own money to take Caribbean Wave Premium Island Cocktails from a concept to a real product. The pledges from this campaign fund production of product for delivery to distributors and into retail liquor stores. Liquor distribution network: developed distribution for other brands within the liquor industry. I knew I needed to do a lot of upfront work to make sure my product and concept would have consumer acceptance. I have done my homework, footwork and personally invested my own funds, time, and passion. Why should I ask you to back me if I am not all in? Graphics – did the graphics communicate brand? I will keep you updated with all progress made. If you pledge you will automatically be added to our Caribbean Wave Newsletter and receive updates on my progress. If you can’t pledge, please send this link to your friends and family. Just getting the word out is so helpful! I am all grateful for your pledges and support. Thanks for stopping by and checking out my project. 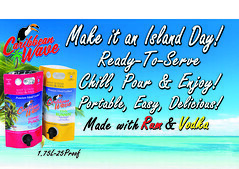 MAKE IT AN ISLAND DAY! LIVE ISLAND STYLE! Contribute. Your financial help goes a long way! Every bit counts. Share. Spread the message by clicking here. While you’re at it, tell a friend about our campaign the old fashioned way – over your favorite cocktail.